← Ladybird, Ladybird Fly Away Home…..
As I have been so quiet of late both on here and on Twitter, I’m sure most of my readers must think I’ve either had my throat cut or even worse been marooned on the Isle of Wight. The latter is mostly true as I’ve been on the Island since mid July with only a very brief sojourn home to make sure Cockrobbinn was keeping the place tidy and looking after our three lovely cats. To be more precise I stayed at home as Cockrobbinn, who has taken up singing since retiring in the Spring, was to perform in his very first concert called Murder, Mayhem and Matrimony. On Saturday 11th July 2015 the Surrey Heath Singers with international opera soloists and the Chameleon Arts Orchestra presented a scintillating evening of the greatest tunes from the world of opera — choruses, arias, duets, trios and orchestral excerpts — creating a veritable feast of the world’s most popular opera melodies. (Their words, not mine!). Included were Mozart’s sparkling Overture to The Marriage of Figaro and Bizet’s sensual Habanera from his steamy opera Carmen, the beautiful Easter Hymn and Intermezzo from Mascagni’s Cavalleria Rusticana and the powerful Chorus of the Hebrew Slaves from Verdi’s Nabucco, the evergreen Pearl Fishers Duet by Bizet and Delibes’ Flower Duet from Lakmé. We had murder (Bizet’s Carmen), intrigue (Mozart’s Cosi fan tutte), unrequited love (Donizetti’s L’Elisir d’amore), heart-rending love (Puccini’s La Bohème), mayhem (Smetana’s Bartered Bride), jealousy (Rossini’s Barber of Seville), suicide (Puccini’s Madame Butterfly) and even matrimony (Mozart’s Marriage of Figaro) and much more. 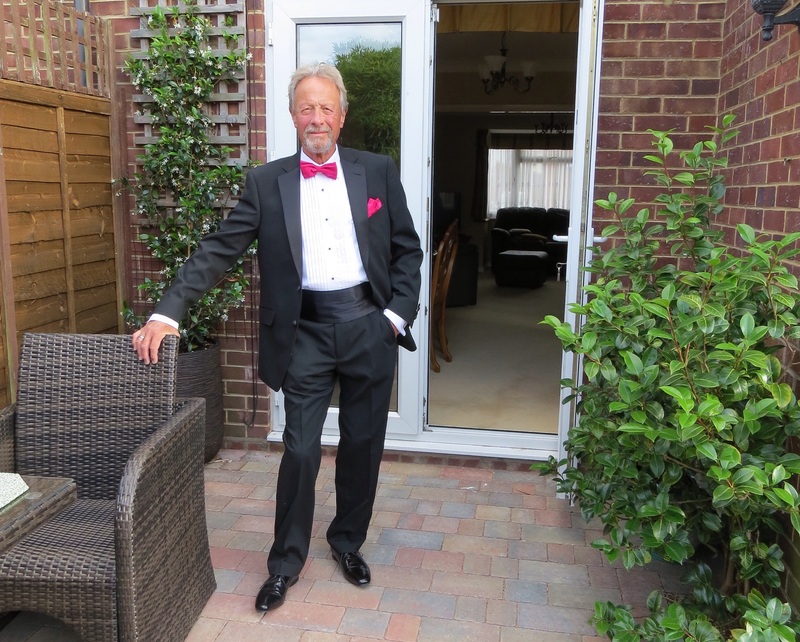 As I usually post pictures of Cockrobbinn climbing fences, falling in streams or scrambling through the undergrowth, I thought it was about time I showed him in his full glory and the following photograph of him was taken just before we left for the concert – very James Bond’ish (well, he is Scottish and taught Sean Connery everything he knew 😉). Cockrobbinn – off to the concert! It was an amazing evening and I was very proud of Cockrobbinn for taking part. It was also a very good excuse to wear my lovely new long dress I had been saving for an important occasion. The following day saw me off to the Island with Cockrobbinn following a couple of days later where we stayed until the end of July when we briefly returned home for our little grandson’s second birthday. We were soon back on the Island though accompanied by our grand-daughter who wanted beach, beach and more beach which suited us perfectly as the weather couldn’t have been better. As I’ve mentioned before, we are really beach bums at heart, so very little time for geocaching recently. The problem with the Island is that we don’t have a permanent wifi and our mobile phone signal is very ‘iffy’ at best. I use a mobile wifi device which works fairly well although can eat up data if not carefully used; I can also tether my iPad to my mobile phone if necessary. There are a couple of places where I can pick up wifi; one being our favourite Wonky Cafe on the beach but with the weather so good this year I have tended to restrict myself to reading just the important emails, banking etc. It has been quite refreshing to limit my internet use but it does mean that I have neglected to read most of my friends’ blogs – so my apologies for this and hopefully I will eventually catch up; sometime in September probably. 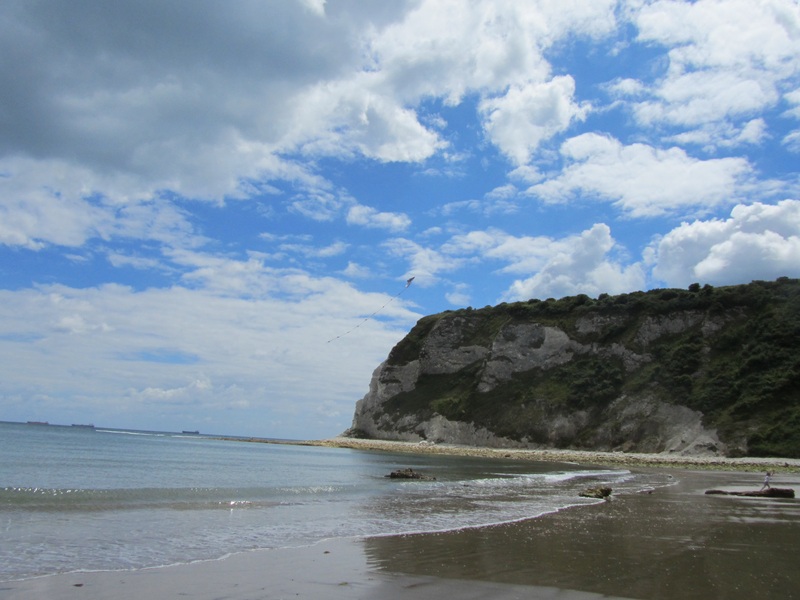 In the meantime however, we have had the excitement of our very first geocache hide being published: WC – On the Beach GC5YC5H. Trials and tribulations but success in the end. We started geocaching almost one year ago on 26th August 2014 and slowly started to think that we would like to create a hide, but we didn’t want to rush into it and the more interesting caches we found, the more we realised that we wanted to create a slightly more difficult one. But how? Cockrobbinn would be the first to admit that he is not particularly gifted in the handiwork department; I wasn’t sure of what or where to start then. It’s also strange how things can sometimes start to fit into place. 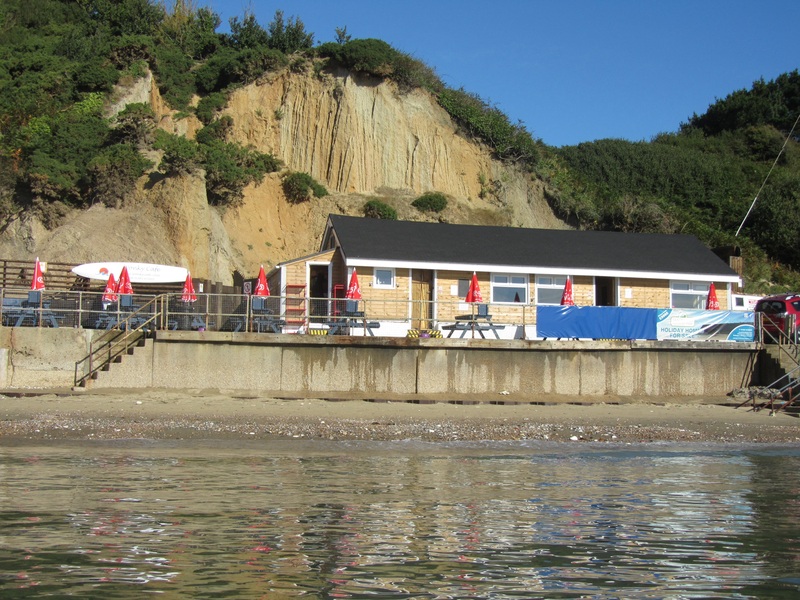 I have often waxed lyrical about our favourite beach and The Wonky Cafe; the proprietors of which are Pat and Geoff Vann (if they ever start geocaching I keep thinking a good handle would be Vannman!). Chatting to Vannman Geoff one day about geocaching we came up with the idea of hiding a cache on or around the Wonky Cafe. It was the perfect place, but strange things happen. The first cache hiding place I thought was spot on. A bison tube attached to a long length of wire and secured by a clip down a pipe; invisible from the ground and absolutely no one except a geocacher would think of looking in that particular place. I sent in the details to Geocaching.com thinking I had ticked all the boxes, but overnight I was informed that the cache could not be allowed as all of Whitecliff Bay and Bembridge Ledge was a Site of Special Scientific Interest and permission had to be obtained from the appropriate department. The reviewer also mentioned that it was possible I might have to move the cache to a different place outside of the SSSI. Also, unbelievably, the next morning I found that the cache had been stolen when someone had tried to access the prohibited part of the cafe by climbing over the gate and barriers and had probably spotted the cache from above. The following day, I found part of the wire and clip buried deep in the sand when the tide was going out. No sign of the bison but it looks like the rest was lobbed into the sea at high tide. Not to be beaten, Geoff came up with an amazing hiding place not too far from the original. I wasn’t too hopeful of being able to obtain permission to hide the cache but a little detective work soon uncovered the correct department where I had to apply. A brief telephone call and I also had the name and email address of the person in authority. I composed my email, describing exactly what and where the cache would be hidden and was delighted to get an almost immediate response confirming that I could place the cache and I could take his email as confirmation. I cannot describe how excited Cockrobbinn and I were when on the 22nd July our cache went live; but for the next ten days we kept surreptitiously checking to see if it was still in place as no one had found it. Then on the 2nd August it was found AND favourited. We are delighted to see that as of today, 11th August, it has been found 5 times, had 1 DNF and joy of joys has received FIVE favourite points. I hope this cache continues to give pleasure to many more geocachers over time. This entry was posted in Cache, Geocaching, Isle of Wight, Whitecliff Bay and tagged Cache, Geocaching, Hide, Isle of Wight, Surrey Heath Singers, Whitecliff Bay, Wonky Cafe. Bookmark the permalink. 4 Responses to Murder, Mayhem and a New Cache! It’s sneaky rather than special. I found it hard to judge how difficult to mark it on geocaching.com. Cockrobbin looks smart in his finery! My son plays in orchestras with many choirs, often I am invited to go along, always a good evening out. Well done on your first hide, good to see it is popular, maybe one day I will get to the Isle of Wight. Thanks Barb for the comments. Ideas are flying around now for our second hide. Once the summer is over we will 1) get back into geocaching with a vengeance and 2) have a better wifi/mobile signal so can be more in touch.